Caption: Fullback Warrick Rhode goes on the attack for defending Gold Cup champions Durbanville-Bellville during their Western Province Super League opener against Brackenfell. Photo: Petri Oeschger/Gallo Images. South Africa’s champion non-university club, Durbanville-Bellville, kicked off their Gold Cup title defence season in style on Saturday when they beat Brackenfell 39-13 in the opening match of the Western Province Super League. 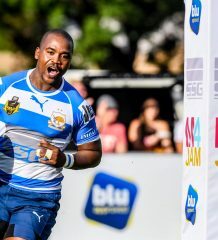 Durbell, who capped a fairytale campaign to dethrone 2014 champions Rustenburg Impala 31-30 in last year’s national final – then known as the Community Cup – are guaranteed of their place in the inaugural Gold Cup, which kicks off in 150 days’ time with a televised opening match on 10 September. Tries from Tiaan Radyn, Etienne Swarts (2), Stuart Austin, Conway Pretorius and Janco Gunter provided new head coach Bobby Joubert with the perfect start as the side from Cape Town’s northern suburbs enter a period of rebuilding following the retirement of a number of stalwart players as well as head coach Jan Loubser. Durbell will be joined in Pool A by Boland champions Onelogix United Bulk Worcester Villagers, Border title-holders Mike Pendock Motors Old Selbornians (who beat Durbell in the pool stages last year), and the Griffons’ number-one club, Tiger Wheel & Tyre Welkom Rovers. Impala are ranked second and face a tough Pool B campaign having been drawn against newcomers Pirates (Golden Lions), triple SWD champions Pacaltsdorp Evergreens and new Limpopo winners Northam Platinum Rhinos. The pool has an international flavour in the form of FNB Wanderers Windhoek, who have been nominated by the Namibian Rugby Union to be that country’s first representative in what has become an international club tournament. Debutants Direct Axis False Bay – who ply their trade in the WP Super League alongside Durbell – head up an interesting Pool C which also includes double KZN Moor Cup champions SA Home Loans Durban Collegians and new Mpumalanga title-holders White River. The pool also has an African flavour with Zimbabwe’s representatives, who will be decided in June following national play-offs in Harare and Bulawayo, rounding out the five-team group. Pool D sees three Police teams drawn against each other. In what amounts to a tournament within a tournament, Don’s Pawn Shop Port Elizabeth Police (EP) will face their Pretoria (Blue Bulls) and Bloemfontein (Free State) colleagues in a group that also includes perennial Griquas champions Belaz Sishen. 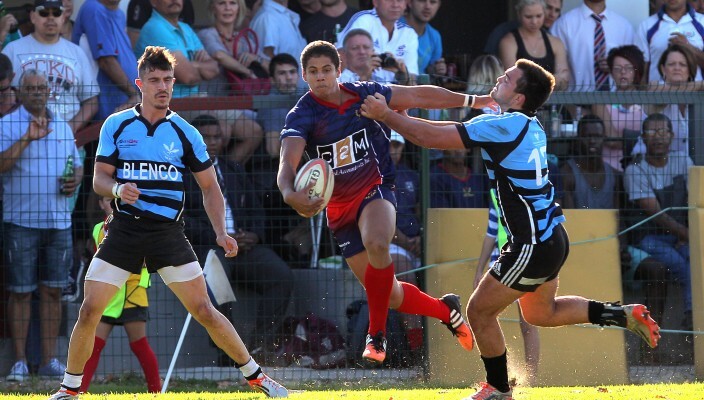 The remaining two qualifier slots will be decided by this season’s provincial leagues – of which the WP Super League is one – with those teams who finish as the best open clubs in their leagues this year, having not done so in 2015, playing off for the last two Gold Cup slots on 20 and 27 August. The Gold Cup will kick off on Saturday, 10 September, with 20 clubs once again competing in a Rugby World Cup-style format, with five weeks of pool stages and the top two from each group progressing to the knockout stages. The tournament will feature 47 matches in all. In a departure from the Easter weekend play-off format which was a hallmark of the Community Cup era, the quarter-finals, semi-finals and the Cup final itself will be hosted by participating clubs.